Situated near Chandigarh, the City Beautiful, Surya World is easy to reach by air, rail and road. You're never far away from great places to see and visit. We are 40 kms from Patiala. – a lively, religious city with a great historical background. The biggest cantonment in Asia, Ambala is also within easy reach of campus; it's home to lots of Surya World students. Or the bright lights of the Punjab & Haryana's capital, Chandigarh, are just 30 minutes away. Major cities like Mumbai, Delhi, Chennai, Bengaluru & Jaipur are connected with Chandigarh which is only 34 kms from Surya World. 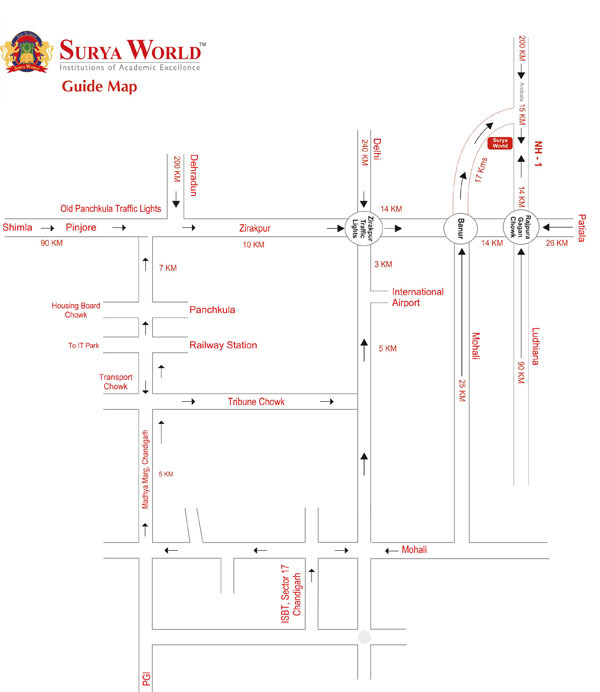 Surya World is also conveniently located within motor-able distance from a number of major cities of North India. It is approx. 215 Kms North of Delhi & it takes almost 4 hrs to cover the journey on NH-1. Surya World is also connected to other major cities like Chandigarh Shimla & Dehradun through NH-21 & NH-22. Surya World is well connected to all the important cities of India being in the close proximity of Ambala & Chandigarh railway stations. Ambala Cantt being a railway junction provides access to number of trains to all major cities of India.